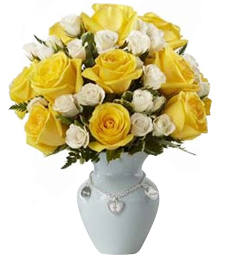 Shown $79.99Flowers are designed to be delivered as close to the arrangement pictured as possible. Add a little bit of charm into their life. Pastel blossoms in delicate shades of shimmering white and sunkissed yellow come together like a spring song of melody to highlight and extra special touch to that unforgettable occasion.